March 2002 would turn out to be my most fruitful month on the sightings front ever!! Because within just under a week after witnessing the large fleet over my home on the 22nd march, today on the 26th march would bring a new surprise. It was around midday that both myself and my brother-in-law witnessed a very low fly over from my back garden of an unknown object, the object came in to view from our right hand side, moving swiftly above the tree tops, it was remarkably low in the sky, which was good, because we could clearly define the shape & detail of this object, with a plasma disk shape, brightly lit with intensity, we couldn't believe what we were seeing, I managed to film it perfectly before it disappeared behind the tree branches, when it came out the other side of the tree it slowed right down, and then came to a stop and hovered several seconds before departing in a southerly direction. 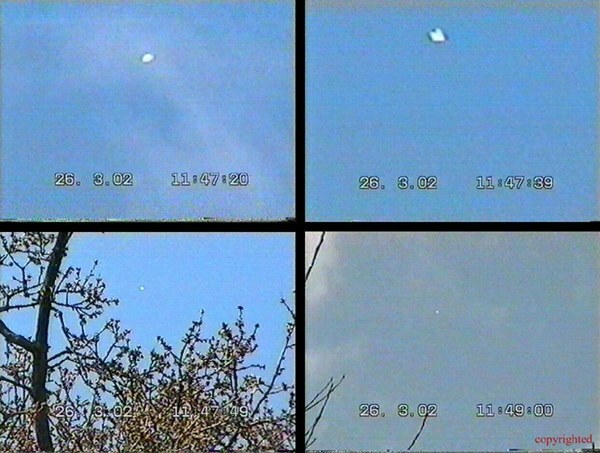 But it was around midday that our biggest surprise came, this would turn out to be my most sensational & bizarre footages I had filmed to date, As we were both standing in my garden discussing the earlier morning sightings, I noticed to the right of our position an object hovering fairly low in the sky, I muttered some obscenities in disbelieve, as to what I was looking at, my brother-in-law quickly focused his binoculars on the object, as I fumbled with urgency to switch my camcorder on and start filming, right on queue the object started to move very slowly forward, the first thing my brother-in-law commented about, was the fact that there were definite structured lights on the object that appeared to be dome shaped, it was clearly evident the lights were flashing in an organized sequence, the shape of this craft was baffling, it kept changing shape / morphing between a cylinder, disk & various other shapes, anyway I managed to film nearly 5 minutes of footage as the object slowly moved off to the north, periodically stopping for several seconds at a time before moving on. 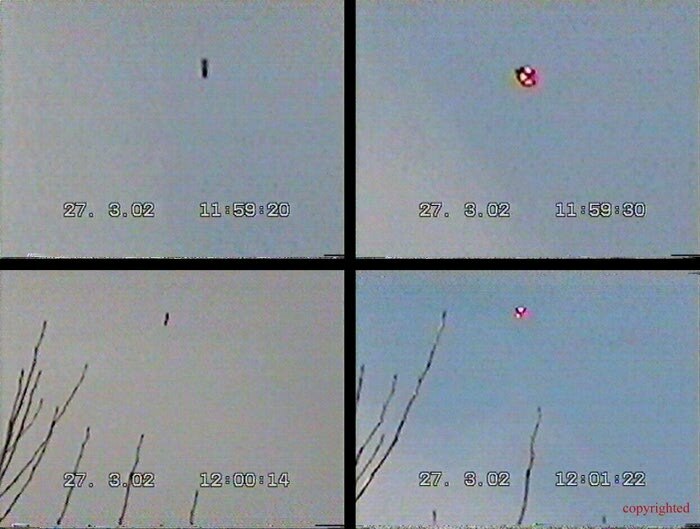 The frequency / intensity of all these sightings had made me really question, just what is going on? 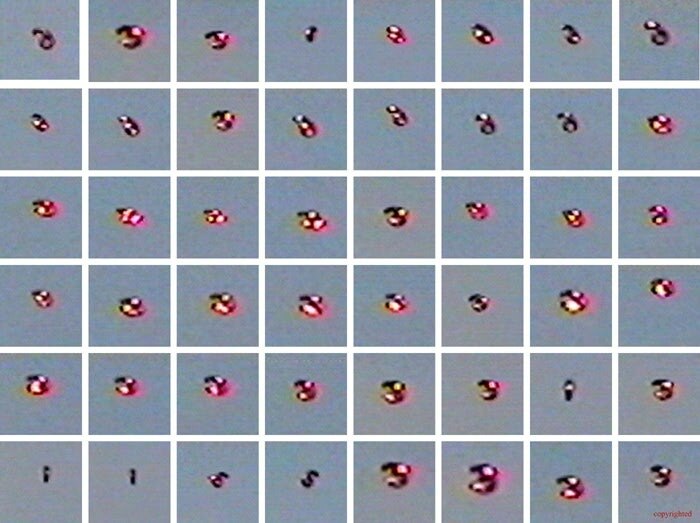 I have been very privileged to capture on film conclusive proof of something that is clearly intelligent, but as far as I know, completely unknown or at least not known or excepted by society in general & in particular mainstream science, the questions are, where do they come from? What do they want? Why are they appearing to me? I just cannot answer those questions!! All I know is that it has happened, and still is happening, but for what purpose, I don't know! !